It’s been a busy and exciting time in the UnITy programme as we have started opening up conversations with industry in search of new contracts and innovative ICT solutions. The UnITy programme will replace the ICT services currently provided to Defra by IBM (ending January 2018) and to the Environment Agency by Capgemini (ending February 2017). We’ve begun to reach out to the supplier market by issuing prior information notices and requests for information. The aim is to involve a wider range of suppliers in procurement of services in the areas of end user environment, hosting and application management, and connectivity. Over the last couple of months we held a series of events with suppliers to outline the current issues Defra group has with ICT services and to get supplier feedback to help the UnITy programme prepare for the formal procurement of new services. 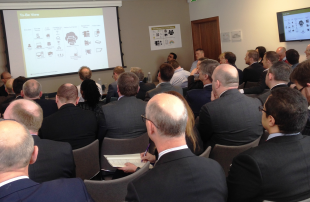 The first supplier event, which we held on 28 April, focused on the managed print service. We didn’t know quite what to expect and we were reassured when we had a very healthy turn-out of 15 organisations. There was a real sense of excitement in the room. Suppliers recognised that this provided them with an excellent opportunity to work on developing ground-breaking services for Defra. Keith Spikings, who led the discussions for UnITy at the event, explained the complexity of the ‘ask’ to suppliers: “We are looking for their help to consider how to innovate in our printing service, but achieve even more sustainability”. At the event, we explained our challenge: running two separate print services. We outlined users’ frustration at not being able to print from any office. We then asked the supplier market to consider how they can help us solve that problem. The supplier market has moved on since we set up the current contracts and it was inspiring to hear the ideas and fresh thinking that can now be applied to print services. Our second event on 16 May looked at the requirements for hosting and application management. 39 organisations were represented on the day. The room was packed! Leading the discussions again, Keith fed back to me that he was “impressed with the levels of supplier interest, not just in the hosting and application management opportunities, but in understanding the UnITy programme and the fit with the wider ICT strategy for Defra”. Our third supplier event, for connectivity, took place on 31 May. This event, like the others, was well attended, with 32 supplier organisations joining us on the day, all keen to hear more about the plans for connectivity across Defra. After all of the events we sought feedback from suppliers and they overwhelmingly reported that they found the events useful. More than that though, they found our way of engaging with them refreshingly open. If you’re a supplier who is interested in hearing more about the work of the UnITy programme you can get in touch with UnITyCommercial@environment-agency.gov.uk.